Yep. Right here. This is the moment when your workweek ends. 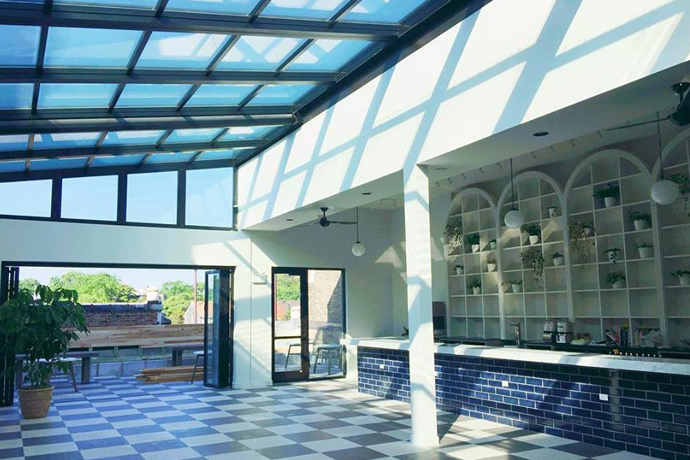 You can tell because of the way you’re thinking about the stunning new rooftop terrace that’s just sitting out there waiting for you with tiki drinks. Point is: Streeterville Social is open tomorrow for your alfresco cocktailing pleasure. Yes, it’s in Streeterville. Yes, it’s at the Loews hotel. And, yes, it’s a lot to take in. 9,000: Space the terrace encompasses in square feet. < 9,000: Next largest terrace in Chicago in square feet. 2: Number of bars on hand for ordering your date a strawberry-and-basil-infused Bourbon Beauty. 6: Number of mini bottles of champagne in the champagne bucket. 0: Number of times you’ve ever felt comfortable ordering champagne by the bucket in public before coming here. 1: Dishes that involve chili and Fritos. It’s called the Belly Buster. Let’s move on. 2: Number of roaming dim sum carts you’ll be chasing here. 5:12: Ratio of tiki cocktails to rosé options available. 6: Number of pétanque balls you’ll use to put on pétanque clinics on the central lawn. TBD: Time you’ll need to learn how to play pétanque first.